Amid growing conservatism and ethnic and sectarian populism in Iraq, parliamentarian Mithal al-Alusi, a Sunni Arab, has become the country's chief advocate for liberal values including a free market, free press, religious pluralism, cooperation among democracies in fighting terror, and human—including women's—rights. Alusi was born on May 23, 1953, in Alus, a small village near Haditha, in Iraq's western Anbar province. In 1976, while studying aeronautical engineering in Cairo, Egypt, he was sentenced to death in absentia by Iraq for allegedly trying to undermine Saddam Hussein by circulating anti-Baathist flyers. He fled Cairo for Syria and then Germany, arriving on August 23, 1977. 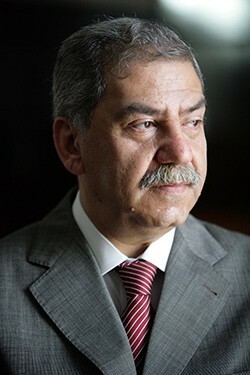 During his German exile, he became active in the Iraqi opposition coalition led by Ahmed Chalabi. In December 2002, to protest the gravity of Saddam's abuses, he staged a takeover of the Iraqi embassy in Berlin. It was his record of staunch activism in exile, he believes, that prompted Iraqis on the governing council to choose him, after the liberation, as leader of the de-Baathification commission. He returned to Iraq in November 2003 and was appointed by the Iraqi Governing Council to head the Supreme National Commission of de-Baathification, a body dedicated to removing top Baathists from government and preparing the Iraqi people for democracy. Trouble started for Alusi in September 2004 when he traveled to Israel to attend a counterterrorism conference at the Institute for the Study of Counterterrorism (ICT) in Herzliya. At the time, the insurgency in Iraq was accelerating. That summer, mass casualty bombings had spiked with sixteen taking place in September alone, killing over 200. Alusi did not hesitate to travel to Israel, explaining that normalized relations between Iraq and Israel are in the self-interest of Iraqis. "Israel," he said, "is a modern state and an important part of the Middle East." Upon his return, the Iraqi Interim Government stripped him of both his government position and security protection for violating a law dating from Saddam Hussein's regime against visiting Israel. Then, on February 8, 2005, terrorists murdered his two sons, Ayman, 30, and Gamal, 22, and one of their bodyguards in revenge for Alusi's decision to travel to Israel. Minutes after the attack, he told reporters, "Even if these terrorists try to kill me again, peace is the only solution. Peace with Israel is the only solution for Iraq. Peace with everybody, but no peace for the terrorists." Alusi has worked to build the Iraqi Democratic Nation Party (Hizb al-Umma al-Dimuqratiya al-Iraqiya), which his sons helped him establish. Despite assassination attempts and propaganda campaigns by Islamist parties branding him a Zionist agent, in December 2005, voters elected Alusi to parliament as an independent with approximately 36,000 votes, a difficult achievement in a system that favors parties. Alusi has boldly defended liberals. In the spring of 2006, as militiamen targeted progressives across the country, he attended women's rights rallies in Baghdad. "They are brave women," he said at the time. "To meet a few hundred Iraqi women in these days who will stand [up] for their rights. It is very difficult. But for how long can they face the extremists without support?" He returned to Israel in September 2008 for that year's ICT conference. Upon his return to Iraq, approximately 100 out of his 275 fellow parliamentarians sought to strip him of parliamentary immunity so that he could face charges of traveling illicitly to Israel, a capital offense under the old Saddam Hussein-era law. Some of those who voted against him did so apologetically, telling Alusi, "We are sorry we voted against you. But we can't do differently [or] we will be killed." Alusi's boldness has paid off. On November 24, 2008, Iraq's Federal Supreme Court, the highest court in the nation, ruled in his favor, maintaining it was no longer a crime for Iraqis to travel, including to Israel. After he returned to his Baghdad headquarters, hundreds of supporters greeted him openly, a scene that would never have occurred under Saddam. No doubt there will be obstacles ahead, but Alusi cites many Iraqis' increased willingness to openly express their support for him as a hopeful sign. "The Iraqi street is free," he says. Heather Robinson is an independent journalist who has contributed to The Wall Street Journal, The New York Daily News, and The American Spectator. She blogs at heatherrobinson.net, politicalmavens.com, and The Huffington Post. Telephone interview with Mithal al-Alusi, Jan. 14, 2009. "Oct. 1, 2004, mass casualty bombings in Iraq," Brookings Institution Iraq Index, accessed Dec. 31, 2008. Jewish Telegraphic Agency, May 9, 2005. BBC News, Feb. 8, 2005. Wall Street Journal, Nov. 1, 2006. Telephone interviews with Mithal al-Alusi, June 2006. The American Spectator, Sept. 16, 2008; The Jerusalem Post, Nov. 24, 2008. Telephone interview with Mithal al-Alusi, Oct. 2008. Related Topics: Iraq | Heather Robinson | Spring 2009 MEQ receive the latest by email: subscribe to the free mef mailing list This text may be reposted or forwarded so long as it is presented as an integral whole with complete and accurate information provided about its author, date, place of publication, and original URL.